We began offering birding and natural history tours in 2006 in Montana, Wyoming, Alaska, Mexico, and Guatemala. Our tours are oriented toward birds, but include information about all aspects of natural history including mammals, plants, reptiles and amphibians, butterflies, geology, and even constellations. We are passionate about our field techniques, the educational undertone of our tours, our commitment to a low-impact philosophy with respect to wildlife, and our ability to have fun. We design our tours as though we, ourselves, are participating in them, and we hope that every participant has an enjoyable trip. Lastly, we make every effort to keep group sizes smaller than 14 people, as we feel this enriches the experience for each individual. Denver Holt is a wildlife researcher and founder and president of the Owl Research Institute and the Ninepipes Center for Wildlife Research and Education, located in Charlo, Montana. His particular focus since 1978 has been researching owls and their ecology. He has published numerous papers for scientific as well as popular publications, and co-authored children’s science books on owls. He has conducted research in North and Central America. He has led numerous birding and nature tours throughout the U.S., Central America, and Africa. He is an avid naturalist with additional interests and knowledge that include insects, amphibians, reptiles, mammals, plant identification and geology. The Montana Chapter of the Wildlife Society named Denver as Biologist of the Year for 2000. His research on Snowy Owls was published in the December 2002 issue of National Geographic Magazine, featuring a Snowy Owl on the cover. Megan Fylling is a wildlife biologist who earned a bachelor’s degree in Zoology in 2000 before moving to Montana to pursue her career. She also earned a Master’s degree in 2013 studying nest-site selection of Lewis’s Woodpeckers. She has studied birds and their ecology throughout the western U.S. and enjoys birding as a hobby. Most recently, she has worked for the UM Bird Ecology Lab at the University of Montana and has worked on various projects including fire ecology, restoration ecology, songbird banding, Gray Catbird overwintering project, and the Bird’s-eye View Education program. Megan has also volunteered for several organizations including the Owl Research Institute, Montana Audubon, and RaptorView Research. Aside from wildlife, her interests include skiing, gardening, reading, hockey, and spending time with her family. Matt Larson is a graduate of the University of Montana. 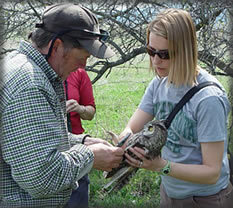 He has worked as a research biologist with the Owl Research Institute since 2008. He is a lifelong naturalist and avid outdoorsmen. His research, focused primarily on North American owls, has afforded him the opportunity to travel and work throughout western Montana and Alaska. He shares his passion for field biology, natural history, and long-term research through public speaking, scientific papers, and as a natural history guide. He lives with his wife and daughter in Missoula, MT. Courtney received her Bachelor’s Degree from the University of Montana in 2001 in Recreation Management. After working for the U.S. Forest Service for several years in both Wildland Fire Prevention and Wilderness Management in Northern California, she returned to Montana to work in the private sector. Courtney has several years of experience working in both recreation and hospitality. She lives in Missoula, MT with her husband and 2 young children. She enjoys getting outside as much as possible, cooking, and living in Montana.